House and time at Malvern: No 6, 1900 - 1905. Died: 23 March 1918 aged 32 in France. Killed in action. Son of Arthur and Mary Louisa Macan, Drumcashel, Castle Bellingham, Co. Louth, Ireland, b. 1886. Lower Modern III—Lower Modern I. House Prefect. Studied in Germany; Farm Pupil in Canada. Great War, 2nd Lieutenant 14th Middlesex 1915. 21st Bn. Middlesex Regiment. Husband of Marguerite Evelyn Macan, of 124, Elgin Crescent, Holland Park, Notting Hill, London. 'On leaving School, he spent four years in Germany, and in 1910 went to Canada, where he spent some years learning farming and railway work. He returned home early in 1915, and joined the Trinity College, Dublin, O.T.C., receiving his commission in the Middlesex Regiment in due course. He was sent out to France in August 1916, and was wounded a month later, by a bomb, while on patrol duty. 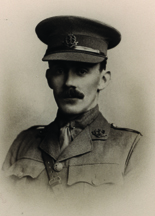 On recovery, he returned to France, and took part in much fighting, and, though only 2nd Lieutenant, replaced his Captain in the big offensive of 1917, being praised for his efficiency. He met his death on March 23rd, 1918, while gallantly leading his men. A simple story of a very simple-minded, wholesome type of boy and young man, who was universally liked and respected wherever he was, and whose watchword in life was duty.' (Malvernian, Jul 1918).